Chamberlain Group v. Skylink Technologies (Fed. Cir. 2004). In a well reasoned opinion, the Federal Circuit (GAJARSA) affirmed a district court's dismissal of a suit arising under anti-trafficking provisions of the Digital Millennium Copyright Act (DMCA). 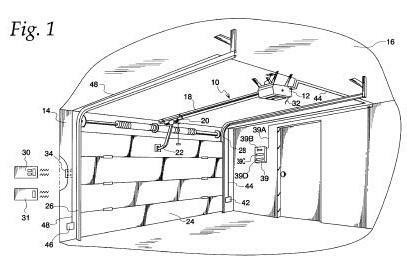 This case involved electronic garage door technology with a "rolling code" to encrypt signals transmitted signals. Skylink distributes a universal remote that can decode the encrypted rolling code. In an attempt to control the aftermarket in remote control units, Chamberlain sued. The court's basic premise is that an element of a DMCA cause of action is an underlying copyright violation -- without such a violation, there can be no remedy. Updates: According to Ernest Miller, the court rescued the DMCA from "one of its most absurd aspects." He is still concerned, however, that the Act, even as narrowly interpreted, will continue "stifling creativity and innovation." More on the story from copyfight.